As usual there's a bit of a double entendre in my title. The immature Green Heron pictured above was surprising in his behavior(I discovered him above me where I thought I might find a Yellow-billed Cuckoo), and the medium I used for this is watercolor pencil, a set of which I received for Christmas two years ago and which I've never learned to like. I was at Morris Arboretum in Philadelphia sometime this summer and heard a harsh clucking sound above me, in a heavily leafed out Horse Chestnut if I remember correctly. There was also a lot of activity across the stream to my right, Paper Mill Run. Perhaps it was even early fall as I know I was looking for wood warblers along the stream. When I heard the sound I thought it might possibly be a Yellow-billed Cuckoo. So I put my binoculars above me. 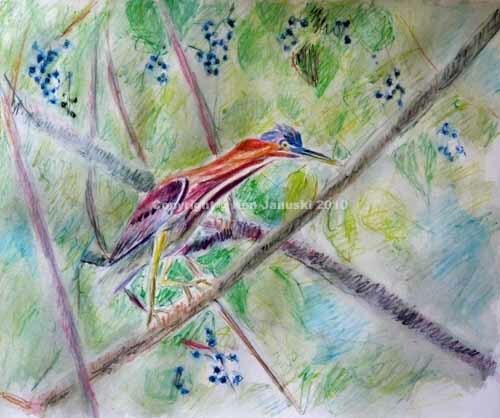 There I was astonished to find an immature Green Heron. I'm always thrown by herons in trees, just like Wood Ducks. Even though I've seen them there, seen them build nests there, and of course that's where they're at in heronries my primitive brain still says: Herons=Water. I don't believe I got any field sketches that day. But eventually I got some photos, particularly when he flew to some trees, covered in wild grape. As I was looking through my old photos for inspiration yesterday I was struck by a photo of him in the trees, along with many of the wild grapes. But why did I choose watercolor pencils? I have only had bad experiences with them. They are in a word: recalcitrant. They don't seem flexible at all. I did pick some up this summer or early fall I think and do a drawing or two. I still couldn't stand them but at least I saw what seemed the proper way to use them: lightly, wtih a soft touch and no expectation of rich colors. Love tints or love trouble. I'm not big on washed out, tint-ridden work. I like something bolder. So why try these for the heron? Well for some perverse reason I thought that I might be able to use them boldly, maybe mixing them with watercolors, or at least using watercolor brushes rather than waterpencil brushes, with their limited flexibility. But once I got started I lost all thought of boldness. 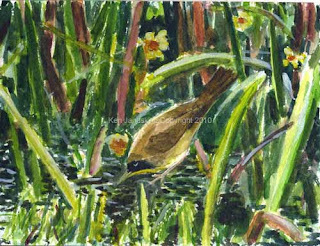 The boldest I got was to sponge out most of the background toward the end when I felt it competed too much with the bird itself. The other reason I think I did this is that I just felt like working differently. I've been doing linoleum cuts for about 6 weeks now, with I think one quick watercolor thrown in. I wanted a change. This Sunday I should have my interview at Printsy posted online. In it there's a question about getting around artistic slumps. My answer is to switch to a different medium. That's what I tried here. It's disappointing. But not so disappointing as to dispel the notion of finally figuring out how to use watercolor pencils in a productive way, at least once a year or so. 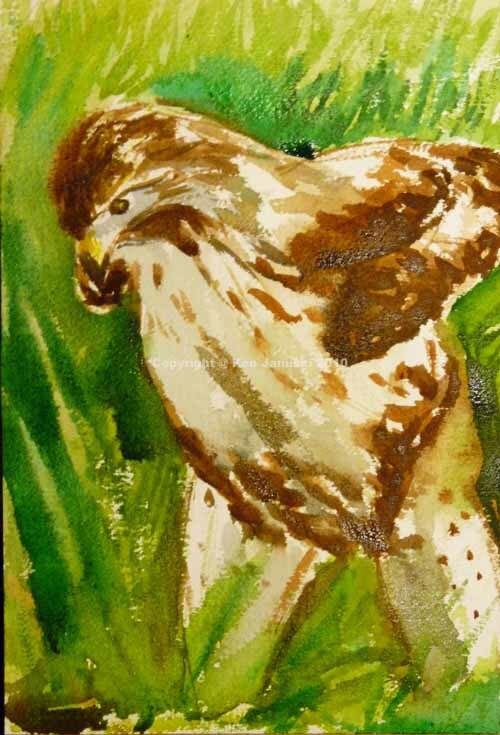 Though the sidebar at right of this page goes on forever some of you may have actually scrolled down it and noticed the link to Wildlife Art Journal. It was about a year ago that I decided to join and pay a subscription for this online magazine. As the magazine itself says, why pay when everything online is free? Well publishers such as them are making a bet that people will pay for quality content. It is the same bet that all publishers have had to consider over the last 10 years or so. Will customers pay for content in the face of all that's now free on the web? For awhile many thought that online advertising would pay for the free content. Except that then came the recession and advertising declined, in almost no instances paying for the cost of providing content. I won't go on about this, though 25 years in the newspaper industry did get me to spend a fair amount of time thinking about it. With Wildlife Art Journal I decided that I wanted to place my bet on people being willing to pay for quality content. Personally I believe that there is no other business model that will work. Quality content takes time and money to produce. Somebody has to pay for it. Or we'll just have low quality free content. Worse we might forget what quality content even was. All well and good you might say but why write about this now? Well the main reason is to note that the pastel at top is in the Gallery of the Commons in the new issue. It's the second time I've had something shown there. So I just wanted to mention that. If you click on the link above you can close the pop-up box asking if you want to subscribe. Many of the articles are free, including Gallery of the Commons. 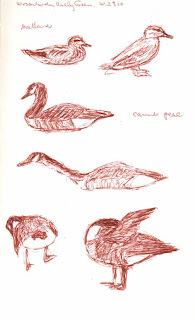 There you'll find a collection of 57 photos of 'wildlife art', some good, some not. 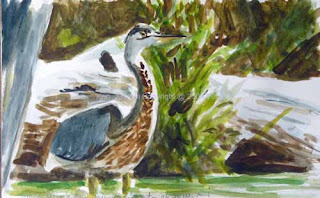 I realize that there are probably few readers of this blog who are interested in wildlife art. So you may want to stop reading right here if you have no interest. The thing is I myself didn't even know if I was interested in wildlife art when I subscribed. My educational background is 'Fine Art.' I have Bachelors of Fine Art and a Masters of Fine Art. Once I decided to start working with natural subjects, birds in particular, I realized that I was abandoning, and would soon be abandoned by, Fine Art. The two just don't overlap, neither in the 20th nor the 21st century. 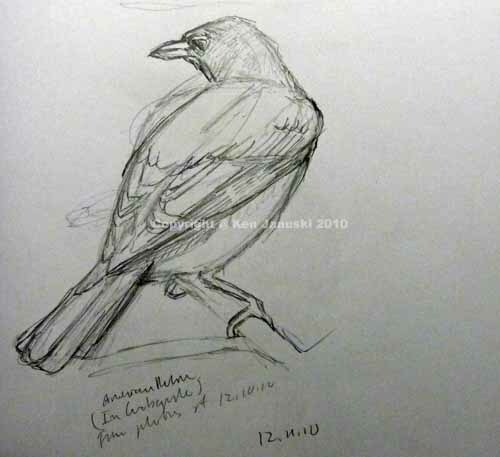 When I started using birds as subjects four years ago I didn't even like wildlife art. Almost everything I saw seemed cliched, kitchsy, formulaic, anything but vital even though it had 'life' in its very name. 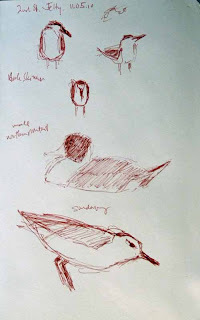 But over the last four years I found that there were some wildlife artists who I really liked and respected. 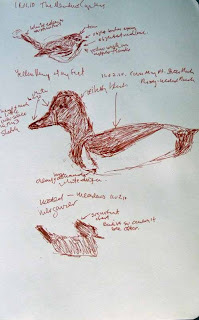 And what convinced me to subscribe to Wildlife Art Journal was that it seemed to be raising the same questions about wildlife art that I had. And that's really why I'm writing this long, somewhat rambling post. The newest issue seems particularly vibrant, raising all the right questions about art, nature, wildlife, the environment and their connection. And it's far more than that. A recent blog entry there had an essay on Laurie David's 'The Family Dinner', about the importance of a family getting together around dinner. I don't find that a far cry from a concern for nature and for a love of art that cares about nature. I really found the new issue to be somewhat like a Christmas present, and an unexpected one at that. If you have any interest in nature, art, wildlife or conservation I'd encourage you to pay a visit. And that annoying popup box that follows you around the site is offering a special subscription fee of only $8 for the next year. It's well worth it, and about twice what I paid! I have just a couple of tiny tweaks left on this before I print an edition. But since I don't know when I'll have time for that I decided to post this version. It's on the same paper, Rives BFK, that I'll use for the edition. Size is 8x11 inches, with the image itself being just 6x9. One thing that surprised me in printing on this paper is that it's a lot less absorbent than the Hosho I've been using. So I needed to press down much harder on the baren to get the ink to print. But since I'm so new to this I'm sure I'll continue to learn about both inks and papers. I said last time that I'd mention some of the thoughts I'd had as I developed this. 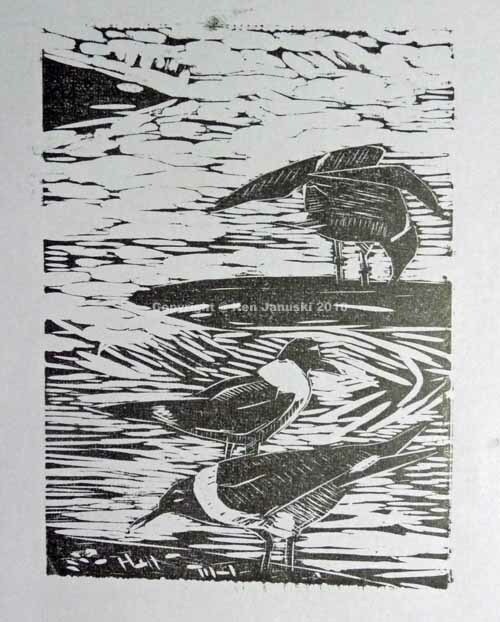 One was a quote from artist Chris Rose about the importance of the quality of line in a linocut. Line can of course be important in any art work. 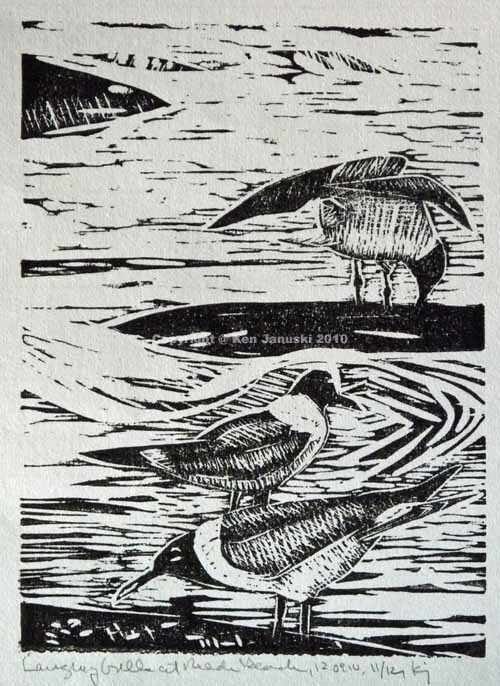 But there's something about linocuts that can make each line really stand out, both a positive line, e.g. the color of the ink, or a negative one, what's been cut away. In fact in my last Laughing Gull linocut I used some lines in the water that became a very important part of the overall design. 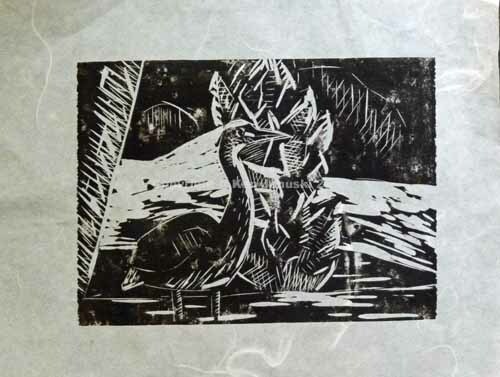 And yet I hadn't even comtemplated their existence when I designed the linocut. I just noticed them and decided to develop them and make them more important. I did less of that here, but still lines did play a part. That was one choice I had to make. Another was how large a range of values to use, especially as I was really limited to just two: the color of the ink and the color of the paper. Through extensive hatching and cross hatching I was able to get some sense of the gray/brown and orange that are dominant parts of a robin's color scheme along with the obvious black and white. So I spent a lot of time working with hatching here, a method really more natural to etching than to linocut. But still I had to do something to enlarge the value range and so that's what I tried. 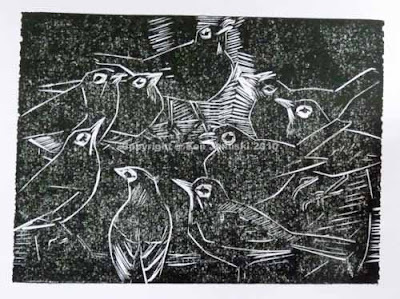 In a certain sense the regularity of hatching works against the more lyrical and expressionistic lines that seem to be the strength of linocut and woodcut. But I wanted both so it was another challenge to try to have both without them contradicting one another. And then there is all that white, of the snow on the ground, of the snow and water in the birdbath, of the striking eyes of robins. As I developed this I tried it to get the white to work with the black and quasi-grays. As I said earlier, I was really struck by this scene when I first saw it in our backyard about 4 years ago. One of the beauties of art I think is that there are no rules that say you can't go back and redo a particular theme. If Hitchcock can do it why can't I!? 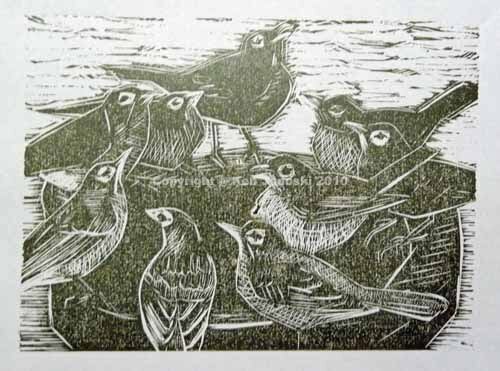 Just a very quick post of version number 10 of the Nine Robins linocut I started yesterday. Still many versions to go I'd guess. When I next write maybe a bit more about the many choices I faced as I developed this. It was almost four years ago that I did my first large-scale and most ambitious watercolor with birds as subject. That is the watercolor above. Actually it may have been the most ambitious watercolor that I'd ever done in my life. Which just goes to show you I think that until the end of 2006 I'd barely touched watercolor. 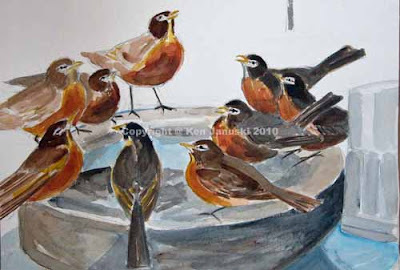 The odd thing is I thought it was successful because I'd been so happy with the original composition, based on nine robins at our backyard birdbath during a blizzard of late 2006. 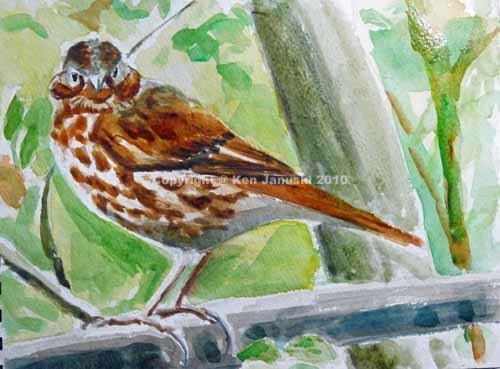 I did admit in the back of my mind though that I didn't understand birds, even robins, well enough to paint them well, and even if I did I certainly didn't have command of the watercolor medium. It seemed like my many years of experience with oil and acrylics counted for nought with watercolors. But that image still stayed with me. 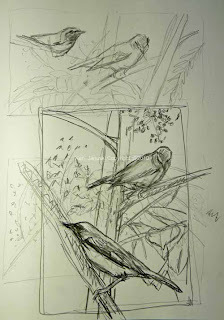 On Thursday and Friday I did some preparatory sketches and finally started a new linocut based on those robins. I just loved the sense of a peak into the social world of birds, in this case a highly gregarious social world. I also liked the many striking eye-patterns in this grouping so that's what I've accented first. Who knows where this will end up but I think it's safe to say that there is a long way to go. But it went nowhere today. Instead we decided to get up at 6 a.m. so that we could go spend the day in primarily sub-freezing temperatures and count birds. 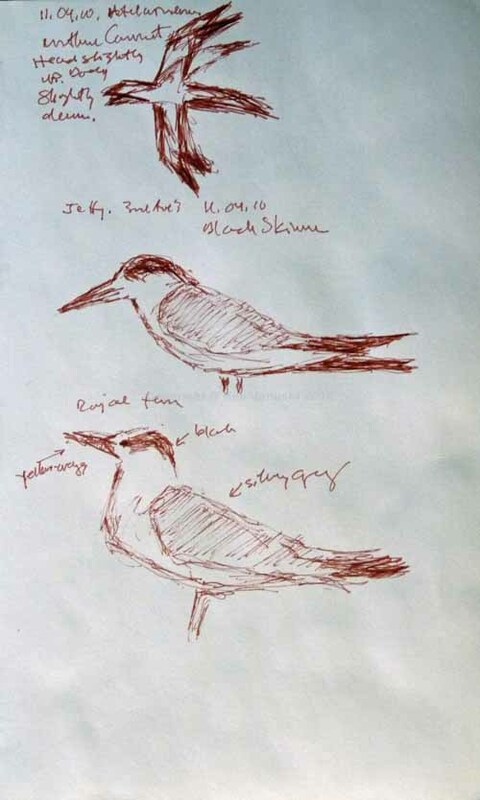 This year marks the 111th anniversary of the Christmas Bird Count. It was developed partly in reaction to the Christmas Side Hunt, which as you can imagine was some celebratory holiday hunting. 111 years later it's hard to know what it means to people. Many things most likely. 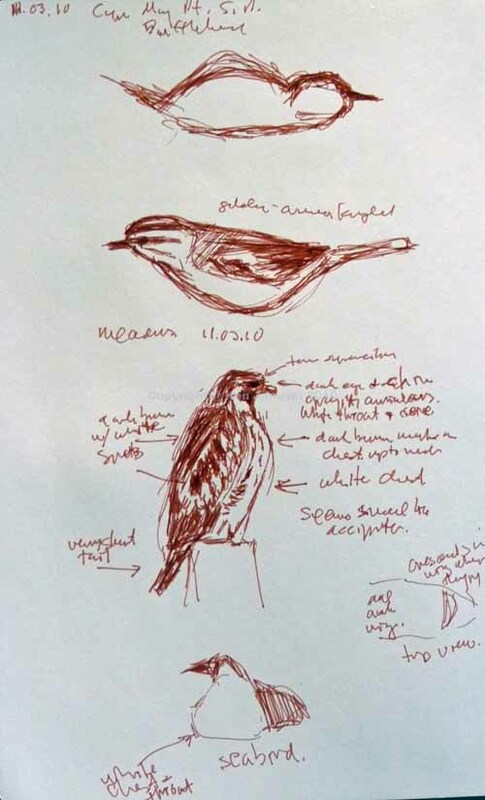 For us it means a chance to get outside in less than ideal weather with a specific goal in mind: contributing to the scientific knowledge about birds in a certain area. 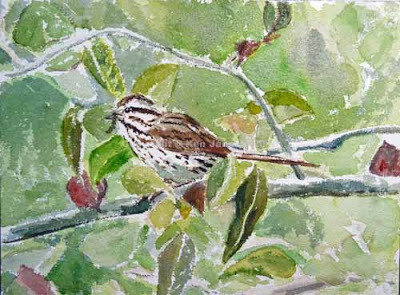 I think it's that sense of science that forces us to stay out longer, finding birds that really should be around, like today's Winter Wrens, Golden-crowned Kinglets and Yellow-bellied Sapsuckers. There's something exhilarating about being out in cold weather, especially if you're dressed for it. Then there's the added bonus of both seeing, or hearing, birds and knowing that you're contributing to an honored tradition that both helps science and the birds that you're seeing. A wonderful holiday activity. And because of that my poor robins at top remain at version four, cockeyed no less because I didn't bother to register the paper on this trial run. But maybe tomorrow they'll see some improvement. Fittingly the species with the highest count today was the American Robin: 50. I just wish I'd had the time to look at them more closely. I'm sure it would have come in handy as I continue this print. Someone on a birding site I frequent suggested that artists there submit work based on either European Robins or American Robins that they've seen in the last month or so. I believe the European Robin is a traditional Christmas bird so that was the idea. 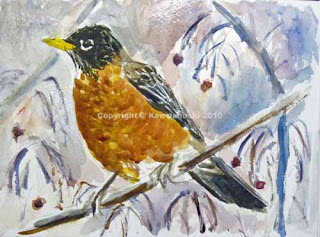 And then since many Americans frequent the site the subject included American Robins. Of course this was a day or two after all the flocks of American Robins had gone through our crabapple. In the next three weeks I only saw one or two robins, and then only briefly. Then yesterday they again came through as a large flock, stripping off most of what is left of our crabapples. More power to them! That's why we planted the crabapple to begin with. But I was too busy to sketch so had to settle for some photos. 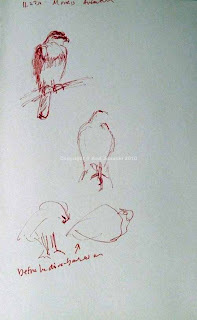 That in turn led to the numerous sketches below, which in turn led to the quick watercolor at top. One odd thing with the photos is that all of the birds look somewhat rotund rather than lanky as I tend to think of this common bird. And my drawings and watercolor pick up that stubbiness. That bothers me. But I'll have to hope that they come through again and I have time to do live sketches. I'm not thrilled with the watercolor. An adult male robin can be really striking. The combination of black, rust orange, white and gray makes for a resplendent bird. That's what I tried to catch. But I don't think it's quite there. 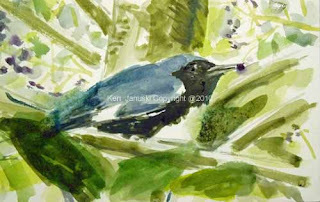 In working on this painting and the drawing I realized how complex both the eye pattern and the bill are.The bills curves down from the top in a surprising way. And the white eye ring is broken up by numerous black spokes. If they weren't so common American Robins might be one of our most sought-after birds. 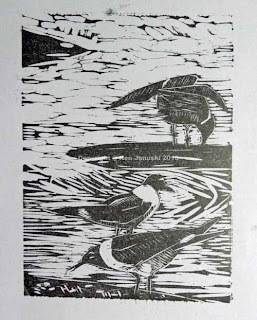 I also finished the Laughing Gulls print a few days ago and printed an edition of 12, one of which is for sale at my etsy site. It's hard to believe but it went through 10 more versions after what I posted here. The main reason for that is that much of a Laughing Gull is gray. And yet the wings looked black in the version I posted. Since this is a one color print, all black, I needed to try various linear techniques to get the sense of gray, or at least to differentiate the wings from the true black of the head. As I did that I found that I also wanted to change the water. So one thing led to another and pretty soon a largely dark print became a largely light print. As I continue with relief printing I keep trying new things. Over the last few days I looked for a new subject. Finally I decided on a reworking of a quick watercolor of some Laughing Gulls I did early this year. As you can see it's just a very quick watercolor. As I look at in the flesh almost six months later it's pretty disappointing. 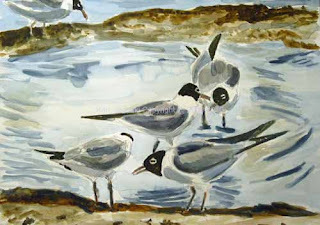 And yet there is something I like about it as well as Laughing Gulls in general. 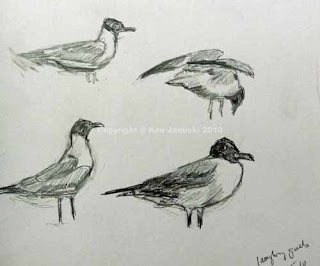 So I decided to do some more sketches of the gulls based on photos I've taken over the last couple of years. The first sketch is the gulls in various poses. The second was my idea for the final composition. Once I had an idea for the final composition I needed a way to get a reverse image on the linoleum block(since it prints in reverse). Like last time I copied the final sketch onto my computer and printed it at the same size as the block. 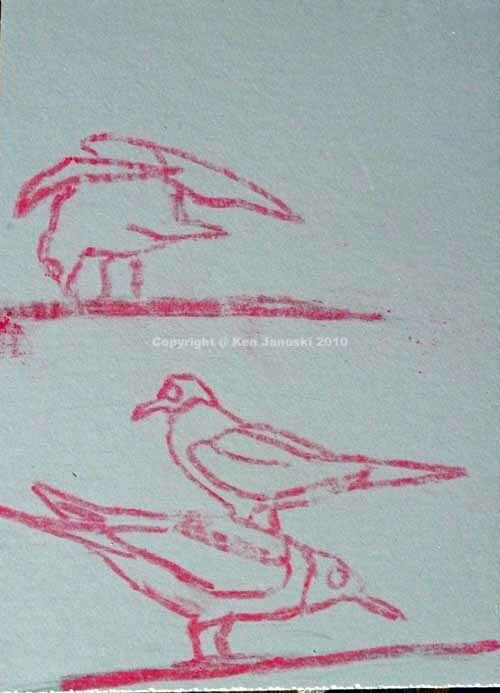 I then covered the broad outlines in red chalk. Doesn't look very hopeful does it? Then I rubbed the paper on top of the block so that it would transfer and give me a pattern for cutting the linoleum. It looks even more hopeless. You really wouldn't think you could anywhere with that would you? But for me most of my work is improvisatory. I react to the medium itself. I just need a framework to start. The version at the top is number six for today. Most likely there will be a few tomorrow before I call it quits. So far I'm happy. I particularly like the variety of marks as well as the gulls themselves. 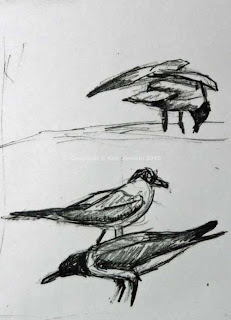 What I'm not quite happy with is my rendering of the gray on the back and wings of the gulls. My ancient Speedball black ink ran out this week so I had to postpone my work on the Yellow-crowned Night Heron until I got an order of new ink, Gamblin 'Portland Intense Black'. That and a new brayer and baren made the printing of the edition of eight go much more smoothly. But I still have a lot to learn. Since the ink seemed thicker and smoother I didn't press down as hard with the new baren. The result was that some of the prints were a bit splotchier and not as uniformly black as they should have been. I also might have removed a bit more linoleum than I wanted. So the print became a bit lighter in tone than I'd intended. And finally I probably should have used the yellow ink rather than hatching a bit more to get the sense of tonal variation. But I'm learning as I go. All in all I'm happy with this. 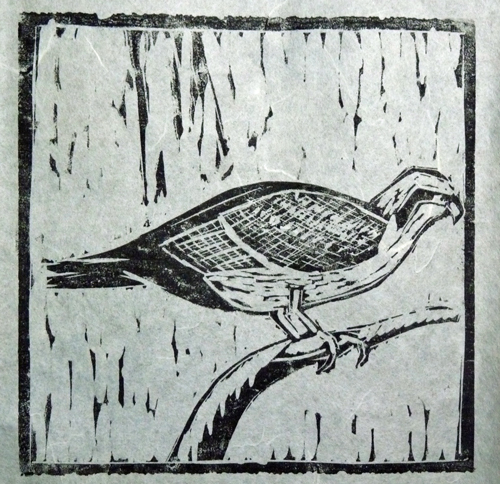 My first reduction linoleum block print ever! I've also realized that I like the forced inexactness of linoleum prints. Though I can do detail, and did in my old insect drawings, I take little pleasure in it. It's just not for me. 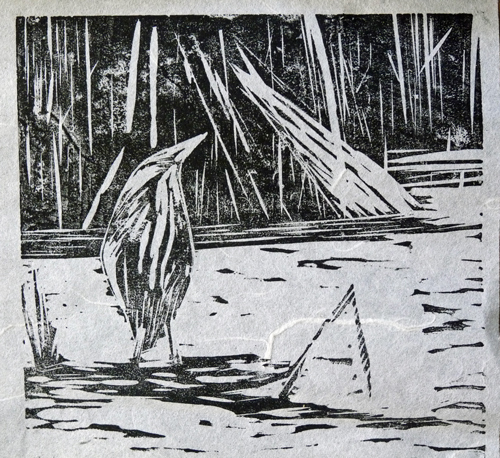 I think I feel freer doing linoleum prints because I don't even have to think about exactness. Instead I can think about other things, like liveliness, color, design, pattern. One thing I rarely mention here is business or commerce. And yet most artists really would like to make at least some money from their work. If you happen to read national newspapers, wildlife art journals, or assorted other media you can't happen miss reports on auction prices of art work. Much of it goes for many millions, by artists half my age. This isn't true so much of wildlife art, where the prices seem to go down by at least 10 times, e.g. $100,000 vs. $1,000,000. And then there is the average artist, who's lucky if they make enough to pay for their supplies. The quality/price equation is something I'd love to write about. But if I did I might never do any more art work. It's just too large a topic and one that makes me too angry. Like housing much of the art world has been taken over by speculators. That explains the multi-million dollar prices. So enough said on that. But artists still need to make some money, enough to cover their supplies if nothing else. Even though I have an online store I'm always interested in other ways for artists to sell their works. I'd heard of etsy but on very quick glance didn't like what I saw. And there was just too much to sort through. 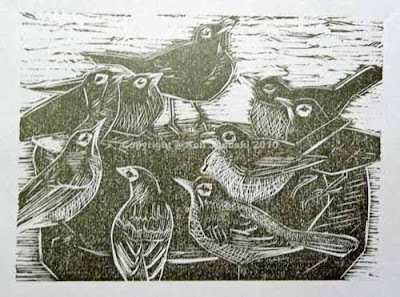 Then I ran across Printsy, the Printmakers of Etsy. All of a sudden I had a context and community for my new interest in printmaking, as well as a possible outlet for sales. So a few weeks ago I joined etsy and this week joined printsy. My store is located here. Though it includes some watercolors from my other online store I expect it to primarily feature prints. 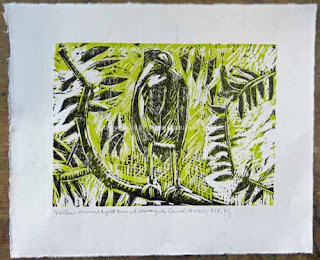 If you have any interest in printmaking I'd encourage you to stop by my site or visit the other sites on printsy. 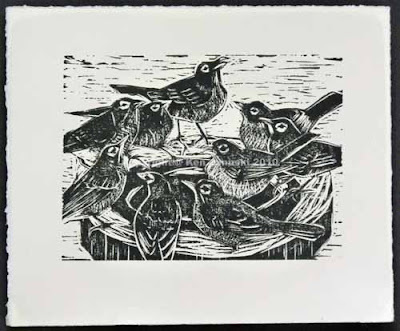 It's a good way to see a fair amount of printmaking. "The paintings (or reproductions) that command the best prices are not necessarily the best when judged by artistic or even scientific criteria. 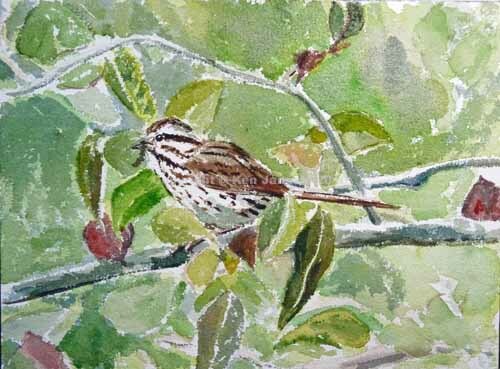 For those innovative wildlife artists who do not achieve financial success their satisfaction may come from the knowledge that their interpretation of the wild and its creatures has led or will lead to a deeper appreciation of a wild time and place." Thanksgiving's passed and linocuts continue their siren call. 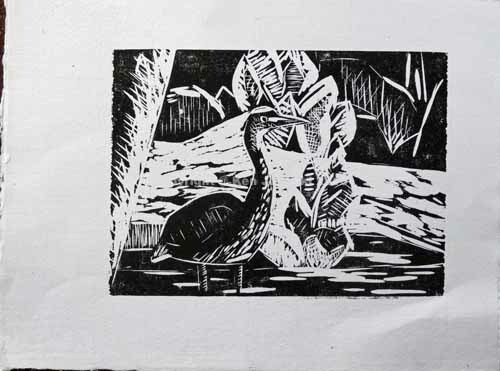 As I think I said in my first post on linocuts I haven't done any printmaking in over 30 years, outside of a brief time when I taught etching about 25 years ago. So no printmaking of any time in over 25 years. But now that I'm back working on a new print I remember printmakings addictive qualities. I'm sure not everyone would agree with this. Some people don't have the patience for it. You don't see your results as you work as with most other media. You can't see the results until you ink up your work and print it on paper, either manually or using a press. Normally I'm not a patient artist. But for me the need for patience is outweighed by the element of surprise. 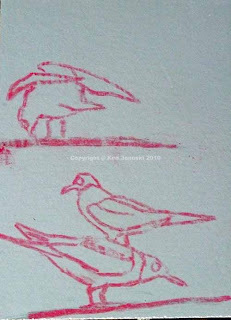 I'm sure that there are some printmakers who can visualize every mark they make and know how it will look when it prints. But my guess is that most printmakers don't. 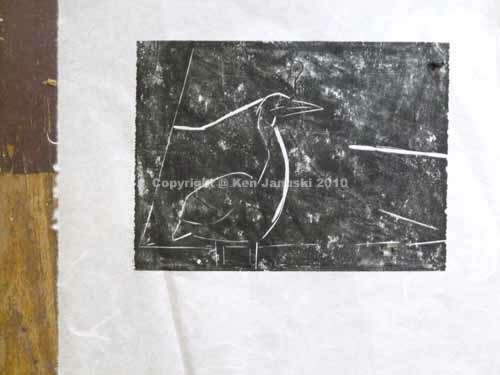 I probably shouldn't say what most printmakers do or don't do though, since I don't know any and haven't for years. But for me there is always a great element of surprise in printmaking. I never know what the changes I've made to the plate/block will look like until I pull a print. I love this. There is a sense of having a dialog, a give and take, with your materials. There is always the element of surprise. Another appeal of woodblock printing and linoleum block printing is that it lends itself to high contrast patterns. If you want you can emphasize every gouge mark you make. Though I work in many ways, and can appreciate many styles of work, I think that high contrast is something that comes natural to me. And pattern does as well. This makes for bright and bold, some might say garish, work. Since I often work that way anyway it's nice to work in a medium that encourages it. And finally, to end my list of appealing things about printmaking, all of the extra work that goes into it pays off in multiple prints. A print is normally not one of a kind. You can print as many as you'd like. 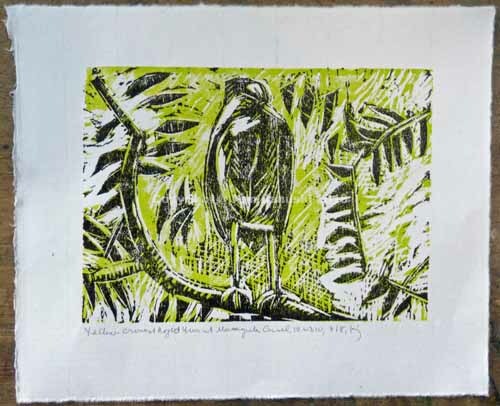 And, if you're at all concerned about the cost of your work being prohibitively high to some people, multiple prints allow you to offer each one at a lower price. All of this is appealing to me. 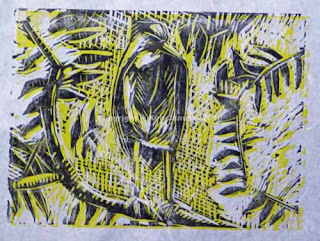 It is untrue however that I can print as many as I'd like of the print at top, an immature Yellow-crowned Night Heron that I saw this summer. I posted watercolors of it this summer. 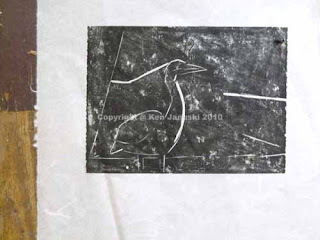 The reason I can't make innumerable prints here is that I've used 'reduction printing.' I've never tried this before. As far as I can tell the proper way to do it is to print each color separately, carving out that area once it's been printed. But once you've done that the first color is gone. You can no longer go back and print more copies of it. So for this one I printed eight copies of the print using yellow ink. The areas that I had carved out before inking the block with yellow ink printed as white or the color of the paper. But the next step was to print in black. So I started carving out the areas that I wanted to stay yellow, the color of the paper, or both. I'm part way through that process now. I've run out of black ink so am waiting for a new shipment before I continue. But I'll never be able to do more than eight prints. That's because I can never go back to the yellow portion of the linoleum block. It's been carved away. This is a rough summary of a technique I've never used before. So take it with a grain of salt. I think it's accurate. Certainly it's accurate about what I've done. Maybe in a year or so I'll be able to talk more authoritatively. Stay tuned for the completion of this print. The next challenge will be to register the paper properly. When I'm happy with what the black portion looks like I'll ink up the block with black ink, put down each of the sheets that have already been printed in yellow and try to get them registered correctly. Then we'll see what we'll see. is to just sit still. I had to think of this today as I was talking to two friends and an Osprey came up quietly behind us, landed, and stayed at least 15 minutes as we continued our conversation. 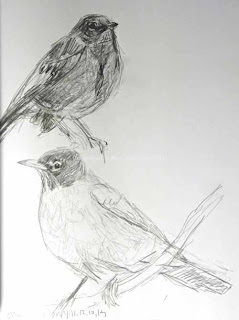 When they left I took up sketching him and he probably stayed for another ten minutes, always on the same branch. It's amazing how often this happens. 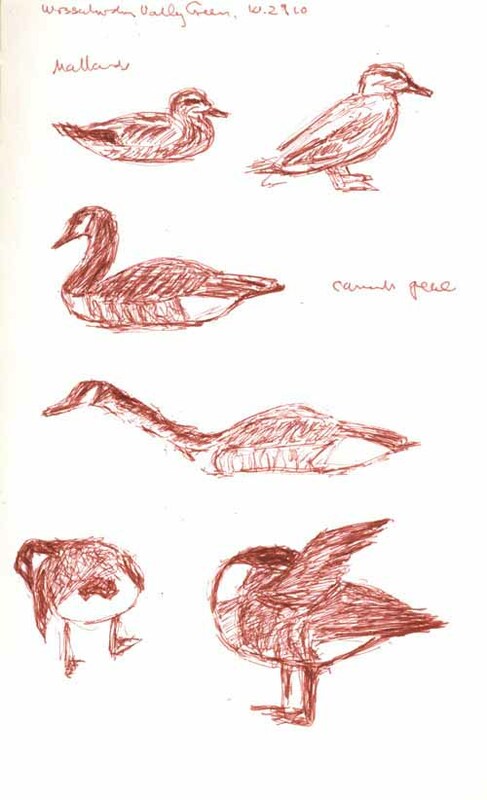 I'd seen very few birds in 90+ minutes of walking and almost all of them the Canada Geese and Mallards in the sketch above. Then we started talking and the Osprey appeared. A Sharp-shinned Hawk also quietly flew in and landed near us while we talked. Meanwhile a Turkey Vulture kept circling the Osprey, getting closer each time before finally drifting off. In any case it just proves, to me anyway, that often the best way to bird is to just sit still and let the birds come to you. In the case of the Mallards and Canada Geese they are almost always there at Valley Green, primarily looking for free handouts I think. But there's something pleasant about just watching and sketching them and their world, especially on a day as beautiful as today. the whole forest suffers. I thought about this today while walking at Carpenter's Woods in Philadelphia. Last summer one of the huge old oaks fell, taking away one more of what seems to be the favorite tree of birds, certainly of migrating warblers. And of course it destroyed everything in its path. Today I saw another huge one had fallen, again taking with it everything in its lengthy path. Young trees as well as old trees, perhaps even endangering a tree that probably was its own age. As I said when a huge old oak falls it does a lot of damage. The innocent suffer. Now I have strong political opinions, leaning more left than right but not oblivious to the huge faults of both parties and the even larger faults of our new 'party.' The unquestioned accepted doctrines of both parties are tiresome. But I don't give my political opinions an outlet here. I can't help it today though. The fallen oak reminds me of the financial crisis and all the people who are still suffering in many ways from it. There is plenty of blame to go around for it, affecting both parties as well as the public, and always centered on greed. But most of the supposed causes, Fannie Mae, stupid and/or greedy home buyers, totally inept rating agencies, are all red herrings. The vast brunt of the blame comes back to just one place: the financial industry and its unbridled greed. And that greed found an outlet due to deregulation. But the Obama administration is like the workers from Fairmount Park who will come in and try to clean up the mess. For whatever reason the Democrats seem unwilling to take credit for what they've done but they have in fact been the foresters who came in and cleaned up. And the answer for the future is a return to much stronger financial regulation. And yet many people seem to blame the Obama administration rather than the financial industry which caused the problem in the first place. Though Democrats were also guilty in the rash of deregulation that took place over the last 20 or so years and led to this disaster they were small peanuts compared to the Republicans. And people want to let the deregulators back in, or even worse the Tea Parties who don't even seem to understand why regulation is necessary! You'd think the present crisis might have shed some light on this but in fact it's done the opposite. There is more and more call for deregulation. Remember deregulation caused the present crisis. A return to it will just precipitate another one. Imagine if you ran a forest like that. You'd not only have to worry about cleaning up after fallen trees by yourself since there'd be no government agency to do so. You'd also have to worry about just about anyone coming in and cutting all the oaks down all on their own as part of their own libertarian, constitutional right. Perhaps they'd prefer to put up a circus and charge admission. Who would stop them? The fact is society, particularly one as large as ours, can't function without regulation. If you're at all awake you've seen examples of regulation gone wrong. It can happen to anyone and often does. But in response I'd say this: have you ever seen a misapplied regulation that's caused the damage the removal of regulation from the financial industry has caused? I didn't think so. Underneath it there is no 'mortgage' crisis. The crisis is due to financial deregulation. It found its outlet through mortgages. In five years it will find something else. 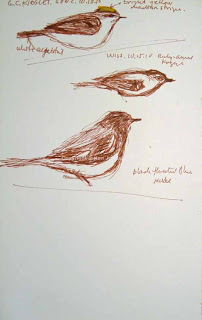 On a completely different tack: two different watercolor studies of Common Yellowthroats done over the last week. Well maybe not quite so different. I just wonder how much more endangered birds such as this will become if the Republicans gain control of the House or Senate. A crisis is always used as an excuse to plunder something. Adios Environment. 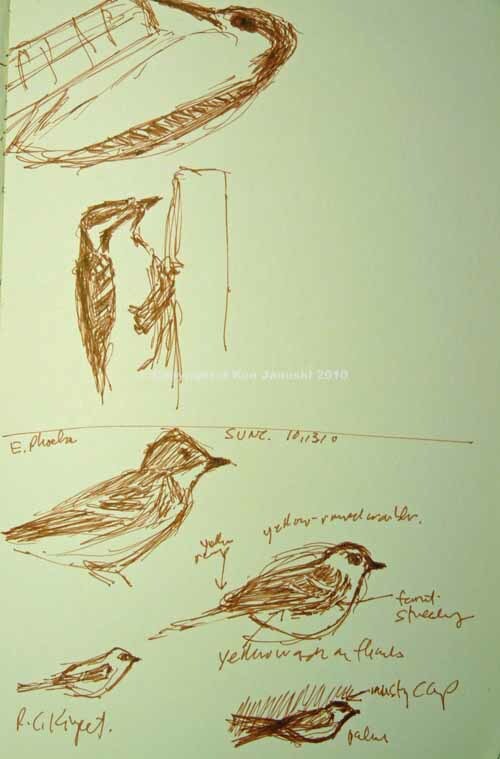 The page at top is a scan of some recent sketches I did from photos of some White-throated Sparrows. Though we rarely get them in our backyard they have arrived in Philadelphia in the last week and, as of a couple of days ago, in our backyard as well. I did a couple field sketches. 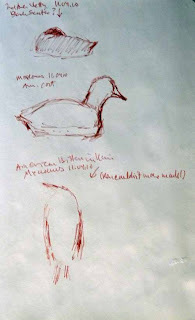 But they flushed easily and I didn't get far with the field sketches. 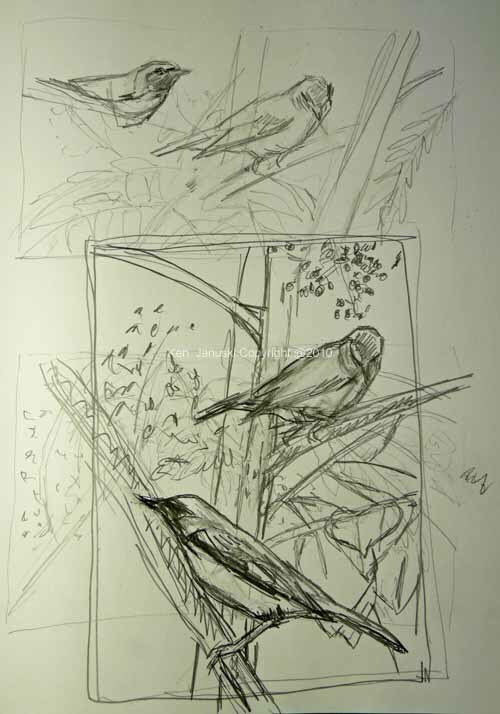 So I decided to do this work from photos just to familiarize myself again with the structure of them and other sparrows. After all they will be THE birds of the next 4-5 months! Drawing them, the recent field sketches I've done, a recent conversation with a birder who watched me sketch at a local hawk watch and then asked about field sketching, and finally the reproduction of a tremendous Goya drawing in a recent New York Times article on a show of Spanish drawings all led me to this post. About 25 years ago I ran across a book that talked about drawing as a part of a general education in the US over 100 years ago. It was just considered a basic and necessary skill. A far cry from today. I never read the book and may be slightly misremembering it. But I think my memory is basically correct. Drawing at one time was just much more important than it is now. And yet.... I love drawing. Even when I was an abstract painter I loved drawing. But it is an odd thing. It changes the 3-dimensional world into two dimensions. It also seized the world in a way. Seizes it and puts it down. In that sense I think it may be almost an atavistic human impulse. I think what got me thinking about this more than anything else was: 1, the Goya drawing. It's the best that drawing can be. 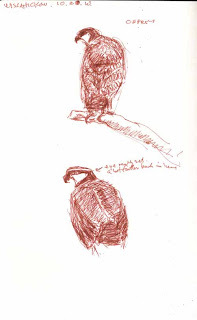 And 2, the conversation with the hawk watcher who was interested in my field sketches at the feeder below the hawkwatching platform. 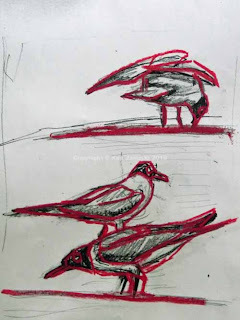 He mentioned Urban Sketchers, a site I've looked at a few times, as well as a site devoted to sketches in Moleskine sketchbooks, a type of sketchbook I often use. 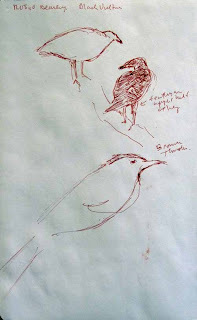 That reminded me of the Sketching in Nature blog that I often notice in the Art section of the Nature Blog Network. And then there is this very odd New York Times blog on learning to draw. The odd thing is not the blog, but it's location at the New York Times. 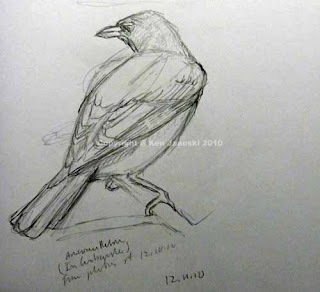 Still it's one more example of a seeming increase in interest in drawing. Basically what I saw was the very highest type of art, as in the Goya, as well as the broad appeal of drawing as in all of the various web sites. It looks like there is almost a Renaissance of drawing, especially of sketching from life, whether it be people, cityscapes, nature, birds or whatever. I could never prove this. And since I'm not part of any of the blogs and websites I mentioned I don't really have a good feel for it. I do spend a lot of time at the Wildlife Art section of birdforum.net as I've mentioned many times. 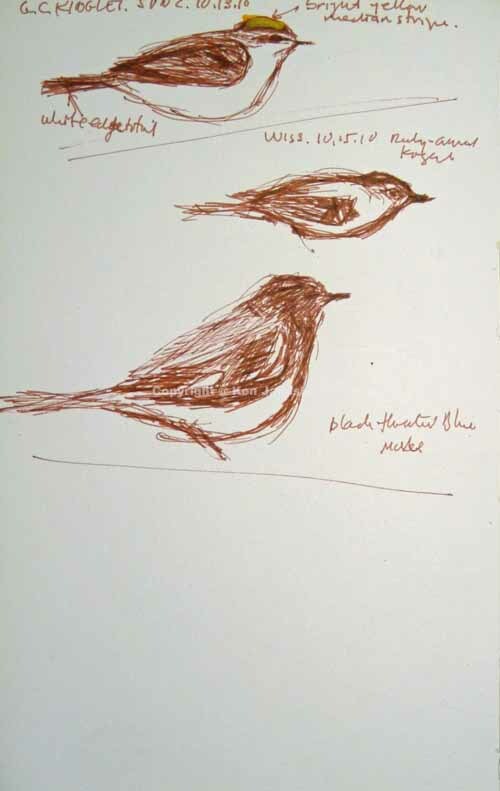 There is a great appreciation of birds drawn from life there. But all in all I'm just not part of any such movement and so all I can do is speak from an outsider's viewpoint. But it's hard not to notice this seeming widespread desire to draw and particularly to draw from life. That strikes me as very good and very welcome. I think it's the foundation of good art. And that Goya reminds me of just how exceptionally good drawing can be. Like music it's a sign of the best in human culture. The more of it the better. 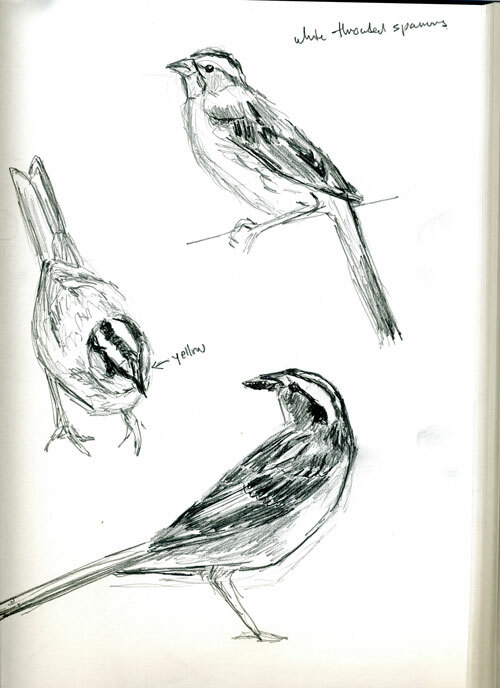 That would be kinglets and warblers, at least when you're trying to do field sketches of them. 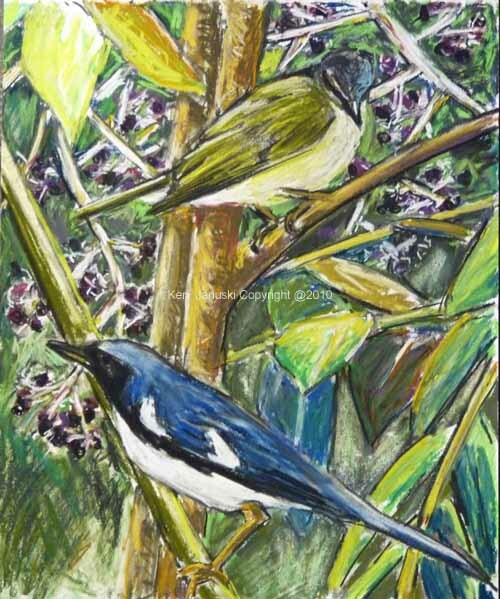 In my last post I mentioned how happy I was with my last two pastel drawings of the Orchard Orioles and the Black-throated Blue and Tennessee warblers. I still I am and plan to continue in that direction. But I also want to continue working from life, getting better at drawing birds as I see them, even if it's only for a split second as is often the case with warblers and kinglets. 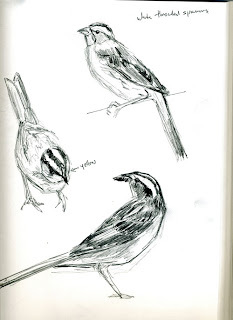 The drawing at top includes a Golden-crowned Kinglet, followed by a Ruby-crowned Kinglet and then a male Black-throated Blue Warbler. 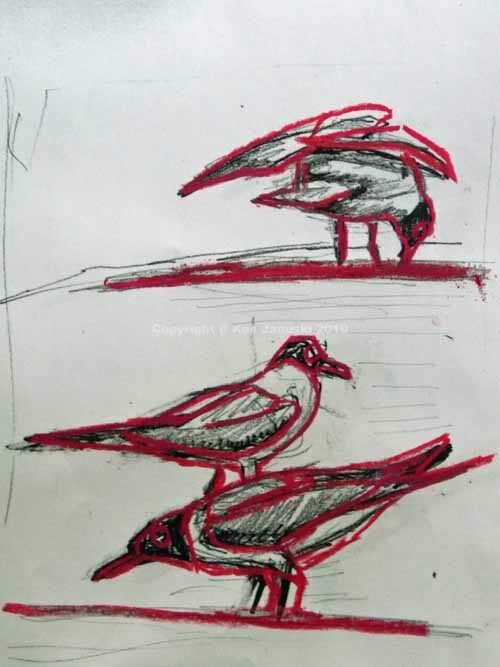 Since I didn't have a scope and the birds only sat still for a split second I looked at the birds, tried to 'burn the image onto my retina' and then look down and start drawing. This seems to be good for getting the general shape of a bird. But unless you're one of those people who can think 6 moves ahead in chess you run into trouble on move number two. Where do the noticeable markings go, for instance the obvious stripes in the head of the Golden-crowned Kinglet and the huge eye in the Ruby-crowned Kinglet? Where exactly are those black and white markings on the black-throated blue? Well these are problems. In each of the sketches above I used my visual memory of other drawings and photos. As usual my memory was wrong. When I checked later I saw that once again I had both the wing position and the markings wrong on the kinglets. And I once again elongated the head of the Ruby-crowned Kinglet. I've made this same mistake in 90% of the Ruby-crowned Kinglet field sketches I've made! The Black-throated Blue is a bit better but that's partially because I held off on some markings until I could get home and check a reference. Why put myself through such torture? If I meet people when I'm out sketching their obvious comment is: why don't you just take photos and use them. It seems hopeless to try to explain the lack of connection that results in working from photos. Not to mention the added excitement of trying to draw what's right in front of you before it moves. That excitement comes out in field sketches I believe. It also teaches you to see. 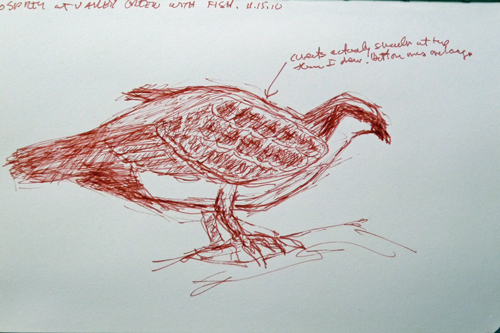 One of the odd things that does happen in field sketching is that you put down your impression. 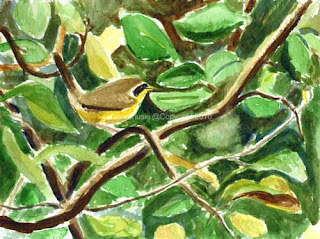 In the watercolor above, which was based on some photos of a Golden-crowned Kinglet I took the other day, I tried to accentuate what I saw with my naked eye, rather than all that the photo showed me. Inevitably photos show you the edge of each primary, secondary, tertial feather. But you don't see the world this way. What I saw instead was a sleek oval with stripes on the head and a black and white arrow/chevron toward the back. The arrow/chevron made no sense to me as I saw it? What was it? What part of the feathers created it? But the impression was most definitely there. When I checked the photos I saw it was a combination of a black mark and some edging on the flight feathers coupled with a slightly lighter color in those feathers. Since I had photos to work from I could have delineated each feather. But why? What I saw was the black and white arrow/chevron shape. So that's what I tried to accentuate. This is the choice each artist must make since the advent of photography. Do you want to be true to photos or true to what you see. They are vastly different. The last sketches above include a Red-bellied and Downy Woodpecker at a feeder. 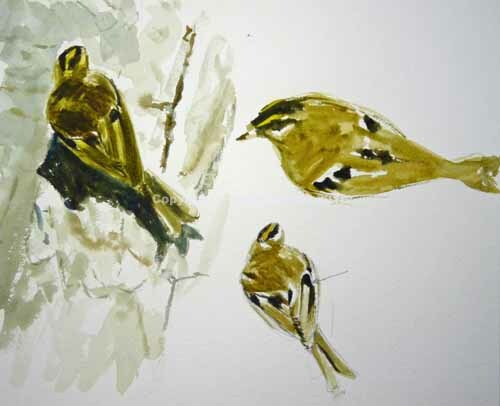 It also includes more warblers and kinglets, none very successful. These sketches are from a few days ago. The one at top is from today and yesterday. I think that they show I'm slowly improving with this. 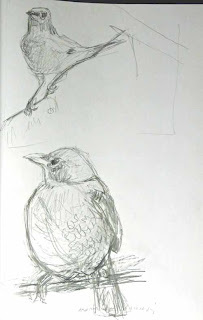 Hopefully I'll finally get a believable kinglet sketch before they're gone until next year. By the way if you do want to see some beautiful photos of Golden-crowned Kinglets in tremendous detail you couldn't go wrong with this recent post from Corey at 10000birds. One of them shows the chevron that I mentioned. I believe that I've finished the new pastel of the Black-throated Blue and Tennessee warblers in Devil's Walkingstick. In the end I stayed pretty close to one of the compositional sketches I showed a few days ago. I did make the berries stronger than in the preliminary sketch, both as a design device as well as to accentuate the importance of these berries to birds. You can only say so many things and write so many letters questioning the wisdom of pulling out Devil's Walkingstick. Sometimes a work of art has more effect. That of course wasn't my main purpose in making this drawing. But it is a possible added benefit. I'm also including the finished version of the Orchard Orioles and nest. It's not terribly different than what I last posted but there are some changes. I also like posting it here because I think these two drawings are fairly successful, at least by my idiosyncratic standards. As an artist you often do works you're not that fond of that quickly find public appreciation and vice versa, works you like that don't seem popular. But as others have said, the public is fickle. I'm sure some artists are successful by catering to public tastes, and sometimes you have no choice if you want to sell anything. But for me I've always wanted to first meet my own exacting standards. These two works have done that I'm happy to say. To me at least they portray an accurate view of something seen, they are well designed in composition and color, and they use the medium of pastel to advantage. Not everyone who sees these is going to agree. In fact some may now be on floor slapping their knees in laughter because this seems so wrong. Seriously. But I'm my hardest critic and I'm happy with what I've accomplished here and I wanted to explain why. It's sometimes hard to convince people how important bird songs and calls are in identifying birds. I remember talking to a co-worker once, who supposedly knew about birds, who remarked that he thought learning calls and songs was for snobs. Real Birders SEE Birds. Well, not exactly. If you know bird vocalizations you can spend time looking where you hear the unusual bird, and perhaps getting it in view in your binoculars, rather than chasing movement with your eyes only to find that you've just put your binoculars on robin number 42 for the day. Today I really didn't need to know any vocalizations though. This time a Black-throated Blue warbler landed in front of me, then vocalized a loud 'Click' every time he moved amidst the Devil's Walkingstick. I'd put down my binoculars for my camera and was trying to shoot some photos. So having him constantly giving me vocal clues as to his whereabouts was tremendously helpful. Warblers don't tend to sit still. So you can bet that by the time you've focused your camera, binoculars or scope that they've probably moved. This constant 'click', also described as 'dik' or 'thik' helped me find him each time he moved. It was also loud. That's one more pleasure of birding: learning the surprising aspects of birds. You wouldn't think such a small bird would be so loud. But it is. The quick watercolor at top was done in 15-30 minutes, based on a photo I took. Like many of these quick watercolors that are intended mainly as blog illustrations I don't take a lot of care with them. They're really meant to illustrate a story/post. 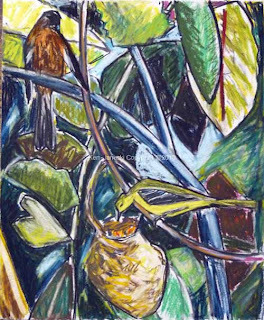 I've been trying to document all the birds that feed on Devil's Walkingstick, a plant that for some perverse reason is classified as an invasive by many. 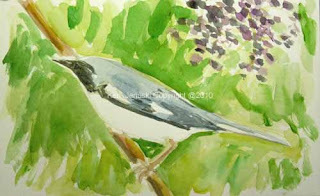 When I got a photo of him with a berry from that plant in his bill I just couldn't resist painting it. of any artist, myself included, often look like the page above. I realized this as I did these sketches today. They're thumbnail sketches of a Black-throated Blue warbler and a Tennessee warbler, both seen in Devil's Walkingstick, feeding on the berries, this past Sunday. 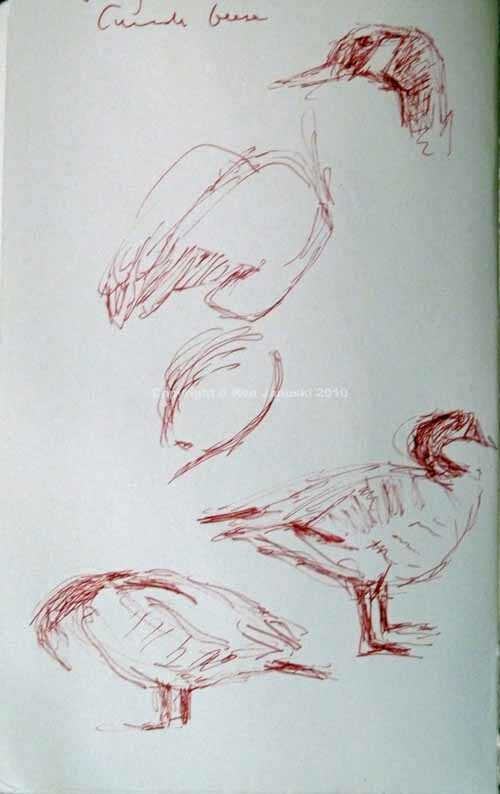 As much as I like seeing a quick field sketch that captures the sense of life in a bird, often at a unique moment, I'm equally taken with planning sketches like these. They are almost never done from life. 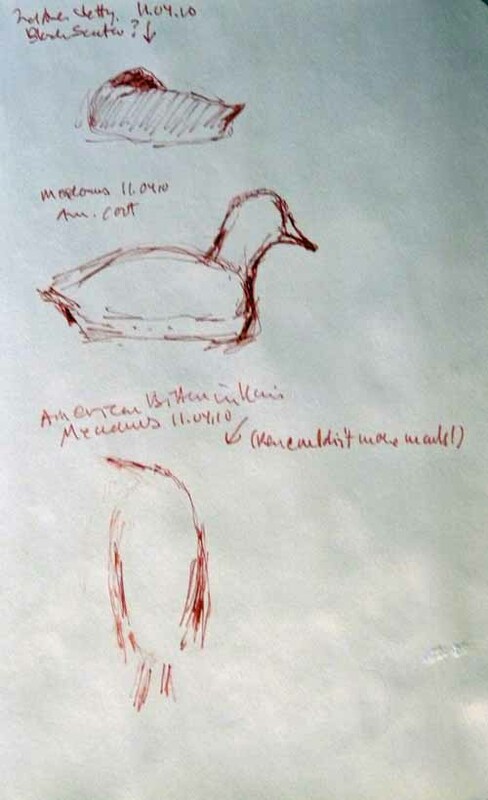 Instead they show the artist working out ideas, often using photos, sketches or just memory for the subject. I had no intention of posting about this. But after finishing this page of sketches it hit me how much I like pages like this, for others artist as well as myself. I think the reason is that you can see an artist thinking out loud, trying out various things. 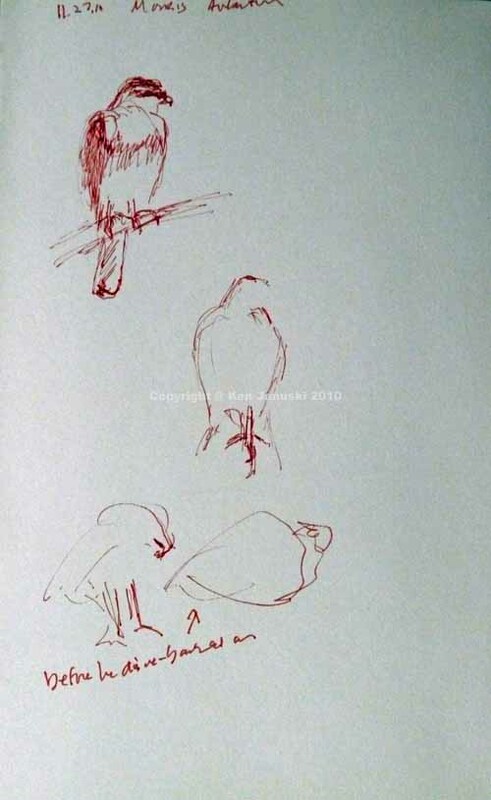 For instance both of these sketches started off horizontal. But as I worked on the lower one I ran out of room to get the Tennessee in and eventually made it into a vertical format. Who knows if the final drawing will look anything like either of these. I got the idea to do a more developed pastel after doing the 15-minute watercolor above. At first I thought I'd just do the Black-throated Blue and the Devil's Walkingstick. But then I thought it also might be interesting, and more lifelike, to include the Tennessee as well. One of the showiest of our wood warbler alongside one of the drabbest. I think one other thing I like about sketches like this is that the artist works in shorthand. The lines are often too light or too dark. The shapes are just indications, not finely tuned. I like that. They show the process of making a drawing or painting. I'm not sure why but I've always loved seeing this.